started at the end of 1962, when a team went to Washington. MiG-17, giving air superiority to Somalia. seater Northrop F-5A in all combat specialities. 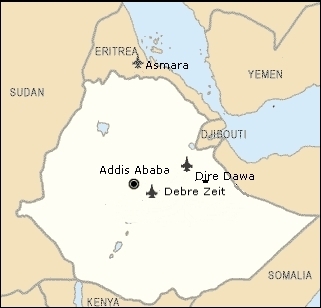 An USAF Mobile Training Team was sent to Debre Zeit AB. Two instuctors were also trained, together with maintenance personnel. Delivery was according one source as follows: handover of the first 2 single-seaters on the 20-04-66 at Mc Clellan AFB, followed by 3 on 18-05-66, 2 on 24-07-66 and 1 on 25-07-66, for a total of 8 F-5As; these were followed in 1967 and in 1968 each by 2 single-seaters. One single-seater was lost shortly after delivery, replaced by one handed over at McConnel AFB on 17-06-68. Two double-seaters were handed over in 1966. Slightly different is the USAF Historican Office version: 7 single/double seaters were delivered during Fiscal Year 1966, 3 single during 1967 and the same during 1968, always during the last quarter of the year. Second lot Northrop F-5A 10511 awaiting, together with 10510, 10512, delivery at McClellan AFB in 1966. These aircrafts were assigned to the Harar-Debre Zeit AB based 5th Fighter Squadron, formerly operating North American F-86Fs. No Sidewinder air-to-air missiles were supplied. 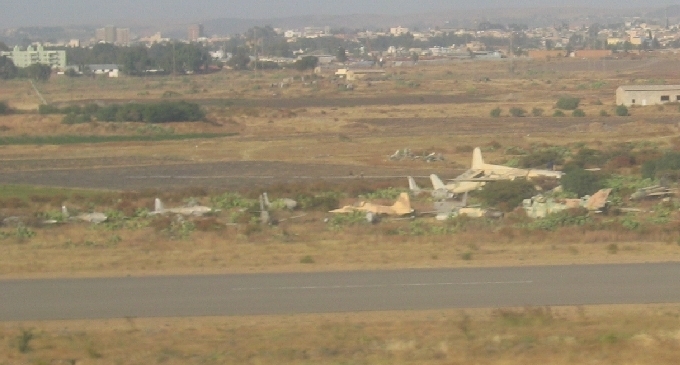 Guerrilla activities had started in the Eritrean region in 1961 but evolved to a full war only around 1970, when Northrop F-5A were transferred to Asmara, together with F-86Fs, armed T-28As and English Electric Canberra B.Mk.52, to operate agains the Eritrean People's Liberation forces. Continous requests for additional Freedom Fighters resulted in the delivery of 4 additional F-5As, handed over at Mc Clellan AFB on 04-10-71. These were ferried from California to Ethiopia in USAF markings, accompanied by an North American T-39 pathfinder aircraft for the last part of the journey, between Ramstein AFB (Germany) to Harar Debre AB via Rimini, Athens, Incirklik, Teheran, Dhahran, Jeddah, Addis Ababa. A long way. There was no change in the F-5 fleet till a military revolution overthrow the Emperor Haile Selassié in April 1974. US military aid continued almost without interruption, even after the new government (DERG) officially declared itself Marxist on 20-12-74, due to the strategic importance of the country, even authorising the transfer of 4 Northrop F-5A from Iran in 1974. Another source mentions that Iran delivered 1973/1974 at least 7 Northrop F-5A and 1 Northrop F-5B, while the USA supplied 3 newly built Northrop F-5A and 2 Northrop F-5B. 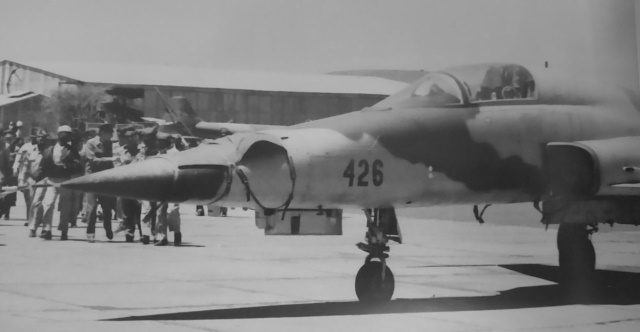 During 1974 Somalia signed a Treaty of Friendship and Cooperation with the Soviet Union which started to deliver MiG-21s shortly afterwards, completely changing the armament balance. Intensive Somali guerrilla operations began contemporaneously in the Ogaden region. The DERG requested McDonnell F-4s to counter the new threat, later scaled down to 16 Northrop F-5E and 8 Cessna A-37s plus AN/TPS43 radars, but the US government was initially not inclined to fully accept the request, suggesting to transfer in 1975 a mix of 8 Norethrop F-5A (former Vietnamese aircrafts) and 4 new F-5Es plus 8 A-37s. The Ethiopians expressed their unsatisfaction and a second offer was submitted beginning 1975 for the sale, under an USD 25m Foreign Military Sales credit, of 16 new Northrop F-5E (formerly foreseen for Egypt) plus AIM-9B Sidewinder missiles, delivery scheduled to start in November 1975. This offer was accepted and the first 8 Tigers were hurriedly transferred to Ethiopia end 1975. The first two Northrop F-5E pilots started conversion end of 1975 at Williams AFB for a 48 hours combat course and completed their conversion in 1976. Conversion air combat manovering was included in the training totalling 48 hours, while the first two pilots in-house were formed at Debre Zeit AFB in 1976; later enough pilots converted to the aircraft to form the 9th Fighter Interceptor Sqn at the same basis. Enough spares had been delivered to keep all these fighters operational for several years. The Ethiopians had learned how to keep them operational as to deploy them in combat and how to obtain additional spares on the black market. Most Tigers were transferred to Dire Dawa for a period at the beginning of the Ogaden War. One of these aircrafts was damaged beyond repair in early 1977 during an Somali attack on the base after which all were withdrawn to Debre Zeit, shuttling between the two bases every morning and evening, together with Northrop F-5A. By july 1977 the 5th Squadron had 2 Northrop F-5B, 15 Northrop F-5A plus one modified to carry camers and 15 pilots. The Freedom Fighters were flown during thar only as fighter-bombers whil the Tigers were flown for fighter rsupremancy. Tension between the USA and Ethiopia increased in 1976; it culminated in the signature of an arms supply agreement with the Soviet Union in December 1976, which included Mikoyan-Gurevitch MiG-17 and MiG-21, and the termination of military collaboration with the USA in April 1977. Delivery of spare parts and of additional Tigers was blocked and the aircrafts were rerouted to Yemen. Freedom Fighters had intervened in Eritrea during 1976 against the local Liberation Army. By 1977 Ethiopian AF aircrafts, mainly of US origin, was below 30% due lack of spares, political purges and defection of Eritrean personnel and aircrews. Two pilots defected to Kassala (Sudan) with their Northrop F-5As, the aircrafts being returned later to Ethiopia. Somalia felt at this point it had good chances to ccupy the Ogaden region and started in May 1977 an, initially, victorious offensive. F-5As as fighter-bombers and F-5Es as fighters, now based at Dire Dawa, played a critical role in slowing Somalian offensive; local pilots fought victoriously against Somalian MiG-21s. Israeli unofficial aid, never confirmed and part of it actually did not took place, included a dozen Israeli technicians helping maintaining the F-5s, pilots (arrived in July 1977) that took part in the air combats (doubtful) and training of 38 pilots (doubtful). Israeli assistance ended suddenly in February 1978. Unconfirmed information state also that Vietnam supplied Northrop F-5As (inprobable) and spare parts (probable) seized upon the fall of Saigon in 1975. A reversal of the war situation happend when the Soviet Union abandoned its Somaly allied in favour of Ethiopia and started an air-bridge on 25-11-77, bringing the agreed aircrafts (and much more war material) into the country. One Squadron each of former Cuban MiG-17 and MiG-21, plus one more of former Soviet Union MiG-21s, started to arrive in December 1977, all supported by Cuban personnell. Fightings ended in April 1978. Losses inflicted were largely exagerated by both countries, Somalia claiming to have shot down at least 8 F-5A, 1 F-5B and 3 F-5E; Ethiopia claimed that its F-5s had shot 13 MiG-21s down (eight confirmed), 1 MiG-17 (confirmed) against the loss of only 2 F-5s. Somalian claims could be contradicted by the later offer for sale of Northrop fighters. Better training of Ethiopian aircrews, who seemed to prefer the agile F-5 to the heavier MiGs, had shown its benefits. Nothrop F-5A pilots had before trained to simulate Nthe MIG-17, and of Northrop F-5E the MiG-21. The firt type of aircraft was eventually used only for ground attack, while the second one were used to fight for air upremacy. The site ejection-history.org.uk lists the loss of 2 Northrop F-5A and 3 Northrop F-5E during the fighting. More detailed information about the war can be found on http://www.acig.org/artman/publish/article 188.shtml and, from the point of view, of the Cuban Side on http://urrib2000.narod.ru/Etiopia-e.html (in Spanish). The Northern region Eritrea was at the time still in a state of war, again necessitating the basing of Freedom Fighters at Asmara and their intervention till they were definitely withdrawn from use due to lack of spare around 1980. One of these aircrafts was claimed to have been shot down near Barentu (Western Eritrea) on 02-05-78. Withdrawn from use F-5s were kept in dumps; early 1984 12 F-5As, 2 F-5Bs and 4 F-5Es were put up for sale. Interest was shown by Thailand which sent a team to asses if possible to make them flyable, but it reported this was out of question. They were still unsold in May 1987. The war between Iraq and Iran in the 1980's brought renewed interest in these airframes. The USA tried to buy them back for USD 7m and scrap them in order to avoid falling them in Iranian hands but Iran did succeed in its efforts to purchase 10 or 12 (F-5A, F-5B, F-5E) in June 1985 at an unrealistic price of USD 68m. The aircrafts had flown very few hours but had been poorly maintained and kept for years in open air. They were in such poor conditions that the Iranian AF initially refused their acceptance, later agreed at half price: USD 34m. Exact number/type of aircrafts sold to Iran is unknown. 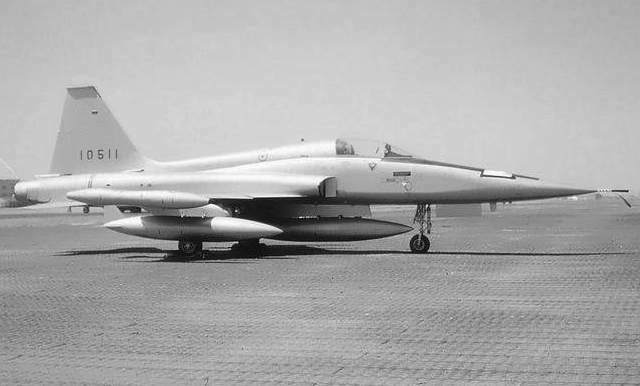 Some sources state that these were F-5As and that the Iranian aircraft industry was able to make at least one flyable around the year 2000, another source states that Iran received 8 Northrop F-5A and 2 F-5B plus 4 F-5E and another one states it received only 10 F-5s unknown mix. Corresponding Ethiopian/US serial for Northrop F-5As and Northrop F-5Bs. Any earlier or later sighting.